Q 1. What is the strength of the KARAM Harnesses? Ans. The KARAM CE range of harnesses are tested as per procedures laid down in the relevent EN norms to sustain a static load of 15 KN for three minutes without showing signs of damage of the webbing or metal parts. Q 2. What is the shelf life of KARAM Harnesses? Ans. When stored in ideal conditions(as specified in the instructional manual) the shelf life of KARAM harnesses is 5 years. Q 3. What is the work life of the KARAM Harnesses? Ans. The KARAM harness is a personal protective equipment. It should be used till as long as there are no visible signs of wear or damage to any part of the harness.It has been observed that when the KARAM harness is used in the correct manner and stored in clean environment (as per storage and maintenance guidelines given in the instruction manual) the harness can last for up to 10 years. Q 4. Can I wash my KARAM Harness? Ans. It is important to keep the harness clean and away from grime and dust. You may wash the harness using a mild soap(neutral Ph) and a soft sponge. Also it is important to dry the harness naturally away from direct sunlight. Q 5. What is the maximum weight of a worker suitable for wearing KARAM Harness? Ans. KARAM harnesses are tested on 100 kg dummy mass when using maximum 2m lanyard. Q 6. Which KARAM Harnesses are ideal for use with KARAM easy seat IMP 004? Ans. Easy Seat IMP 004 can be used with KARAM harnesses – Magna 3 and Rhino harnesses PN 56 and PN 57. Q 7. How do I know that the intended life of KARAM Lanyard is over? Ans. KARAM rope lanyards are provided with colored tracer strands. These strands fade when exposed to ultra-violet degradation hence indicating possible damage and weakening of the rope lanyard. This way the user can know that the lanyard is now not fit for further use. Q 1. Can we use KARAM Rope Grab Fall Arrester PN 2000 with any Anchorage Line other than KARAM Polyamide Anchorage Line? Ans. KARAM rope- grab fall arrester PN 2000 is a guided-type fall arrester on a flexible anchorage line and is certified as per EN 353-2. KARAM recommends that the rope-grab be used only along with KARAM polyamide anchorage line of 14mm or 16mm dia because it has been tested and certified in this combination only. If used with any other anchorage line the product cannot be considered as a certified equipment. KARAM shall not be liable for any consequences incurred thereafter. Q 2. What is the frequency of servicing for the KARAM Retractable Blocks? Ans. KARAM recommends that the KARAM retractable fall arrester blocks be sent to KARAM authorized service centres for inspection and servicing each time the equipment is arrested to a fall. Additionally KARAM also recommends annual servicing of blocks which are in use. Q 3. What is the advantage of the Swivel Eye on the KARAM Blocks? Ans. The swivel anchorage eye provided on the KARAM retractable blocks allows the block to move along with the user without causing undue twist of the rope. Hence in the event of a fall the victim does not swivel dangerously while suspended at a height. Q 1. What can i use for safe Anchorage where the Termination Hook of my Lanyard is unable to provide the required opening? Ans. KARAM offers an entire range of anchorage slings of various lengths. These slings can easily be wound around strong support structures(taking care that there are no sharp edges) hence providing ready anchorage points. Q 2. How can I get safe Anchorage on structures like I-Beams? Ans. KARAM provides a ready solution for anchorage on beams through its product beam anchor reference SA 08. The adjustable arm of the anchor post allows usage on beams of various widths. Q 3. How can we get safe Anchorage over the lenght of a roof? Ans. KARAM provides a portable easy to use temporary horizontal anchorage line PN 3000 which is available in a total length of 20 m. This line can be adjusted for lengths ranging from 5m to 20m. 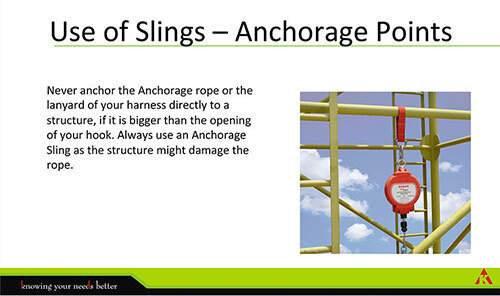 You can use anchorage slings on the posts to connect this horizontal line at the two ends. Q 1. What is better? 4 Point Or a 6 Point Helmet? Ans. The impact of force is transmitted from the shell of the helmet on to the cradle through the cradle attachment points. These points also work to absorb the shock hence minimizing the impact of force on the user’s head. This is equally and effectively achieved by 4 point and 6 point helmets. KARAM offers the option of both 4 point and 6 point helmets which are tested and certified as per the safety norms. The user may make the choice as per his discretion. Q 2. Is KARAM Helmet suitable for use on bikes? Ans.KARAM helmet is certified for protection of the head from overhead impact hence it is ideal for use in environments where there is potential fall of material, tools, etc. from above. KARAM helmet is not tested nor certified for protection against impact from the sides hence it is not advisable for use on bikes. Q 3. What is the shelf life of KARAM Helmet? Ans. When stored in ideal conditions away from direct sunlight and humidity, the shelf life of KARAM helmet is 3 years. Q 4. What is the work life of KARAM Helmet? Ans. The KARAM helmet is a personal protective equipment. It should be used till as long as there are no visible signs of wear or damage to any part of the helmet. Q 5. How do we inspect the KARAM Helmet? Inspect the shell for any signs of crack, deformation, burns or break. Inspect the cradle for any signs of cut or damage. Inspect the ratchet or chin strap adjustment for its proper working. It is also recommended that the KARAM helmets are periodically inspected by competent personnel authorized by KARAM. Q 6. Is it necessary to use a chin strap in the KARAM Ratchet Helmet PN 521? Ans. The chin strap provides snug fit of the helmet over the user’s head. The same is provided by the ratchet mechanism in KARAM helmet PN 521 hence a chin strap is not required with helmet PN 521. Q 1. Why does a Block needs servicing? Ans. As per EN 365:2004, all Fall Protection Equipment must be inspected and recertified at least every 12 months by a competent person (4.4.). Also, once a block has arrested a fall it must be inspected by a competent person before being used again (4.2.2. m). Besides complying with the norms, inspecting/ servicing the block on an annual basis or after a fall-arrest would mean longer life and optimum performance in case of another fall, thus saving lives AND money. Note: As block is an engineered product, competent person must be trained and authorised by the manufacturer (3.3.). Q 2. Who will Service / Repair the Blocks? Ans. Blocks will be Serviced / Repaired & Tested at the Authorised Service Centre set-up by KARAM, using genuine KARAM spare-parts. Post servicing/ repair, the blocks are subjected to same stringent testing procedures and quality checks as a new block. The block will be cleared for dispatch only after satisfactory performance as per the norms. Q 3. What is included in the Block Servicing? Ans. The servicing includes inspection, cleaning and restoring the block’s internal mechanism, replacing certain mandatory parts, testing, packaging and dispatch. Q 4. Why not just procure new blocks instead of getting them serviced? Ans. Servicing can be done at approximately 30% of the cost of a new block, provided no major replacement is required. That is a huge cost-saving on an organisations safety budget. Q 5. How can we ensure that the block is ready for use after service as it is a matter of life of a worker? Ans. All servicing / repairs will be done by Technicians trained by KARAM, using genuine KARAM spare-parts. Post servicing/ repair, the blocks will be subjected to same stringent testing procedures and quality checks as a new block. The block will be cleared for dispatch only after satisfactory performance as per the norms. Q 6. Will KASC provide a Test Certificate for the serviced Block? Ans. Yes, the Test Certificate will be provided for the serviced Block and will be dispatched along with the invoice. Q 7. Who will bear the transportation cost? Ans. The transportation cost is not included in the servicing fee and will be borne by the client. The blocks should be sent to KASC on Paid basis. KASC will dispatch the serviced blocks on To-Pay basis. Clients should indicate their preferred Transporter / Courier while sending the blocks. Q 8. Who will Issue the Way Bill / Road Permit? Ans. Way Bill / Road Permit or any other entry document will be issued by the Receiver. Hence, initially KASC will issue the Way Bill / Road Permit; subsequently the client will issue the Way Bill / Road Permit for return dispatch of the serviced blocks. Q 9. What is the Payment Process? Ans. Blocks will be serviced/ repaired against Advance Payment only. KASC will send a Proforma Invoice (PI) after inspection of the block indicating if any part is required to be replaced (in addition to the mandatory parts covered in servicing). Client will make the payment against the PI. KASC will carry-out service / repair of the block after receiving the payment. Please refer to the “KASC Process Flow” for further information. Q 10. We have purchased the blocks through KARAM distributor. Do we have to send the blocks through the distributor or directly to KASC? Ans. It is at the client’s discretion whether to send the blocks through the channel partner or directly to KASC. Q 11. What if the Block malfunctions during the warranty period? Ans. KARAM gives three months warranty on Blocks against any manufacturing defect. The warranty is effective from the date of purchase. In case the block malfunctions during this period, KASC will service the block without charge. However the two-way transportation cost will have to be borne by the client. The warranty does not cover damage/ malfunction due to wrong usage, storage or misuse. Please read “Do’s and Don’ts of Retractable Fall Arrestor Blocks” for further information. Q 12. What will be the Post-service warranty period? Ans. Post-service warranty period will be 30 days from the date of dispatch of serviced/ repaired Block. Q 13. Will KASC also service/ repair blocks of other manufacturers? Ans. KASC is authorised for servicing / repair of KARAM blocks only. We are committed to “understanding your needs better” hence we’re offering these services to our esteemed client have put their trust in KARAM products. KASC will not service blocks manufactured by others. Q 14. What are the applicable taxes? Ans. VAT and Service Tax will be charged as prescribed by government rules. Q 15. How much time will it take to service the block once payment is made? Ans. The block will be readied for dispatch within 3 business days of receipt of payment. The actual dispatch is dependent on receipt of waybill/ entry permit, if applicable. Q 1. Why do we need safety spectacles? Ans. In industries and other working conditions, there are hazards like dust particles, metal chips, chemicals and radiations according the process carried out. To protect us from these hazards, we need proper safety equipment. Q 2. Will one safety spectacle protect us from all hazards? Ans. No. There are various models of safety spectacles, goggles and face shields designed and manufactured according to the need of different hazards. We have to select the suitable one and use. Q 3. How is a goggle different from a spectacle? Ans. A spectacle generally has a lens mounted on a frame with side arms and it covers the maximum of the area around our eyes while in a goggle, the lens is mounted on shroud and it completely seals the area around eyes. Goggles generally have headbands for better fit. Q 4. What is the material of lens in a safety spectacle? Ans. Safety spectacles are generally made up of polycarbonate lens due to its properties that make it the most suitable. There are also other options like acetate, trivex, CR 39 etc. Q 5. Does a person using a prescription glass need safety spectacle? Ans. Yes. Normal prescription glasses do not have the impact resistance, physical design and UV protection which are needed in the workplaces. So, do not provide the needed protection. Q 6. How can a prescription glass user wear safety spectacle? Ans. There are certain models of safety spectacles that are compatible to be used over the prescription glass. KARAM offers ES 007 and ES 014 models for this purpose. They are optically neutral and hence do not cause any change in the power of the prescription glass, thereby offering best vision. Q 7. Which lens should be used for protection against UV rays? Ans. Polycarbonate, by its nature filters 99.9% UV rays. In that way, all KARAM spectacles have UV protection. Q 8. Are safety spectacles suitable for chemical protection? Ans. No. Chemical splash goggles are the suitable protection against chemicals. They cover and seal the eyes with a tight fit, so that the chemicals cannot enter. KARAM offers ES 008 and ES 009 for chemical protection. Q 9. Which lens material has the highest chemical resistance? Ans. Though Polycarbonate has a good resistance over many chemicals, acetate lens has a higher resistance compared to other lens materials. KARAM offers ES 016 with acetate lens. Q 10. Which spectacles can be used for welding work? Ans. For welding work, welding shield with proper IR filter is the suitable solution. Q 11. Is IR filter common for all types of welding? Ans. No. There are different IR filter shades. The wavelength of IR emitted from different types of welding works varies. 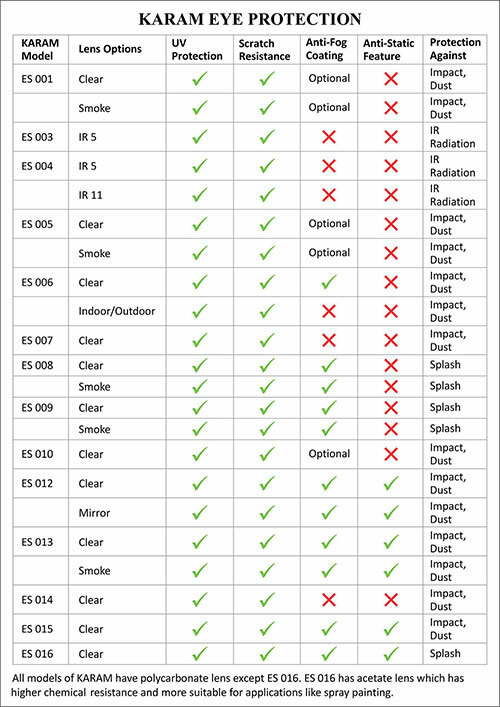 We should select the suitable filter. Generally IR 5 shade suits all gas welding types and IR 11 suits arc welding types. Q 12. What are the welding spectacles present for? Ans. Welding spectacles are suitable to be used by the helpers and supervisors. Direct welders should use welding shields and helmets. Q 13. Where can we use smoked spectacles? Ans. Safety spectacles with smoked lens are suitable for working outdoor and in high light conditions. They should not be used for welding. Q 14. Can amber lens be used for night vision? Ans. No. Amber lens enhances the vision by blocking some colors in the present light. It cannot be used in absence of light. Q 15. I have to move frequently between machine shop and outdoor works very often. Which spectacle will be suitable for me? Ans. The indoor/outdoor spectacle with a slight tinted coating makes the user comfortable both in the outdoor and indoor light. So that is the most suitable spectacle for your work. KARAM offers ES 006 for this application. Q 16. Is that model ES006 a photochromatic one? Ans. No. None of the models of safety spectacles are photochromatic. It is a slight tint of coating done on the lens. Q 17. What is hard coating? Ans. Polycarbonate lens get scratched due to its physical property and the working conditions where we use it. So, to minimize scratches, a chemical coating is done. This is called hard coating. Q 18. Why do the spectacles get fogged during usage? What is the solution for that? Ans. Fogging on lens happens while working in some applications due to moisture. It will affect our vision. For such applications, anti-fog coated lens should be used. Q 19. Is there any solution to avoid dust build up on lens while working in cement factories? Ans. Yes. The dust gets accumulated on the lens due to the difference in charge between the lens and dust particles. Anti-static lens prevents development of charge and minimizes accumulation of dust over the lens. Q 20. How is the heat resistance of the safety spectacles? Ans. The safety spectacles are tested at a temperature of 55°C during the impact test. A human being wearing safety spectacle cannot bear and work in such high temperatures. Such works should be carried out with proper suits. Q 21. Why do the goggles have ventilation? Ans. The goggles give a complete sealing by tight fit and hence the user gets sweat soon. Also this sweating creates moisture that disturbs the vision. So, the goggles are provided with indirect ventilation holes for the comfort of the user and clear vision. Q 22. What is the life of a safety spectacle? Ans. The life of a safety spectacle is not fixed and it varies according to the usage and maintenance. The working conditions also affect the life of the spectacle. Q 23. How is the quality of a safety spectacle ensured? Ans. There are many certifying bodies to test and certify the safety spectacles. The popular certifications in India are the ISI, ANSI and EN certifications. The respective markings will be embossed on the spectacle permanently. Q 24. What are the numbers and letters present on the lens of most safety spectacles? Ans. They are the lens markings. These markings are done according to the tests the spectacle has undergone based on the respective standards (Contact us for further details). The frames also have such markings. Q 25. Can we wash the safety spectacle with water? Ans. No. The safety spectacles should never be washed with water as the chemical coatings will get spoiled. Q 26. How should we maintain a safety eye wear? Ans. Any safety eye wear should be cleaned with a soft cloth (mostly provided with spectacle) in a gentle way after every use and stored in a proper case. The lens should not be placed on rough surfaces. It should not be washed with water. We can use the proper lens cleaning solutions available in the market to clean the lens. Q 27. Can we use the welding spectacle in Laser applications? Ans. No. Laser is a process where higher energy and heat are involved. So, there are different spectacles and standards for laser protection. Welding spectacles are not suitable for laser protection. Q 28. What is an FT impact test? Ans. According to EN 166, the safety spectacles are tested at various speeds with a steel ball of 6mm diameter, 0.86 grams weight. Test is done at 45m/s and marked as F.
Test is done at 120 m/s and marked as B. If the test is done at 190 m/s, then it is marked as A. The letter T denotes that the spectacle has been treated at extremes of temperature (-5°C for 1 hour and +55°C for 1 hour) before the impact test. Q 29. Does a FT marked spectacle gives proper protection against molten metal? Ans. No. For proper protection against molten metal, we should use a safety goggle marked BT as the impact of molten metal would be higher. Q 30. Is there any AT marked spectacles available? Ans. No. At marking is done for face shields used in blasting kind of applications where very high impact is possible. Q 1. Why are safety shoes required? Ans. In industries and various working conditions, there are several hazards including physical hazards like falling of heavy and sharp objects, hitting on machinery, slips due to oily floor, chemical splashes etc., To protect our foot from all these hazards, shoes with special safety features are required. Q 2. What are the differences between a regular shoe and a safety shoe? Ans. A safety shoe has toe protection caps made of steel/fibre. The sole of the safety shoe has been designed to provide higher grip to the floor and withstand penetration of sharp objects and heat. Regular shoes do not have these safety features. Q 3. What is a steel toe? Ans. A steel toe is the cap made of steel positioned below the upper front part of the safety shoe in order to protect the wearer from impacts and compressions. The steel toe is tested for impact and compressions according to the standards. Q 4. In our workplace, we have electrical hazards. Will a safety shoe with steel toe be suitable for us? Ans. Safety shoes with composite toes are suitable for work locations with electrical hazards. They provide the same protection against impact and compression as a steel toe. Q 5. How does the sole protect us from hazards? Ans. The sole of a safety shoe is constructed of three layers. The outsole which is in direct contact with the floor, midsole above that which gives strength and durability and the insole which is in contact with the foot through the insock. These layers provide the required safety for the user. Q 6. If the safety shoe is with such a construction, will it be comfortable for the user to wear all the day? Ans. Certain reputed brands make safety shoes with breathable leather which gives possible air circulation. Also, shock absorbing feature is provided in the sole part and it gives comfort to the user. There are also other comfort features like soft tongue, insock for reducing fatigue to the user. Q 7. What is injection moulding and how does it affect the quality of the safety shoe? Ans. Injection moulding is the latest method in shoe construction, where the PU is directly injected and attached to the leather part. This gives the best bonding and hence the life is long lasting. No adhesives are used to attach and hence there is no problem of adhesive failure in this type of construction. Q 8. Which material is the sole made up of? Ans. There are various material options for sole including Polyurethane, nitrile rubber, PVC etc., Each material has its own advantages and limitations. Polyurethane is better because of its properties like light weight, heat resistance to an extent, chemical resistance, comfort etc. Q 9. What is the role of leather in the quality of a safety shoe? Ans. Leather is used to make the upper part of the shoe. There are different layers of leather which differ in quality. The upper most layer has the highest quality and it is called grain leather. It gives higher life and strength. Q 10. Is it necessary to wear socks with a safety shoe? Ans. Socks are important while wearing any shoes. And most importantly in safety shoes, socks are essential for comfort and protection too. The continuous friction between the leg and shoe may cause blisters if socks are not used. Also, the fit of socks is essential for comfortable working. Socks of proper material are to be used as it may cause odour and itching if low quality socks are used. Q 11. I move frequently from the office to factory and attend meetings also. Can I have a safety shoe that looks better? Ans. Yes. There are shoes with very good formal look and safety features including steel/fibre toe. There are also sporty look safety shoes. KARAM offers a wide range of formal and sporty look safety shoes. Q 12. Where is the anti-static property required? Ans. In some work locations where involvement of chemicals, explosives, microchips etc., is there, friction causes electrostatic charge which may lead to spark and explosions. Here, antistatic property is required to prevent accumulation of charge. Q 13. I use size 8 of regular shoes. Will my size change in case of safety shoes? Ans. No. Generally, the size does not change in case of safety shoes. But still, there may be slight change in sizes among different manufacturers. Hence a trial test is essential before purchasing a safety shoe. Shoes without proper fit lead to discomfort and compromises safety. Q 14. How should a safety shoe be maintained? Ans. Safety shoes should be cleaned and left to dry off after every use. They should be stored in a proper box. Antistatic shoes should be completely soil free as it may affect the property. Polish the safety shoes regularly. Q 15. Can a new shoe be stocked before usage? Ans. Due to the property of PU, safety shoes should always be used after purchase as soon as possible. If it is stocked for a long time, sole breakage and separation are possible. Q 16. Are safety shoes common for male and female? Ans. No. There are exclusive models for women designed to provide comfort according to their foot anatomy. The sizes also vary from men to women. KARAM offers two exclusive models for women.